A new subdivision being constructed by Polygon NW Company to include close to 24,000SF of Lock+Load Retaining Wall System. Site work began several months ago and walls are being installed as lots are being platted over the site. Lock+Load Retaining Wall System will be used in a variety of applications all over the site. Lock+Load will be used to retain adjacent property, lots, and roadways. A new culvert is being installed on the site and Lock+Load will be utilized to hold up the roadway crossing the culvert. These walls will reach heights over 16’ on each side of the roadway. Using Lock+Load within subdivisions allows the developer to maximize their lot sizes by placing any fencing directly behind the wall panel. This application not only allows for a bigger lot, it eliminates a walking ledge at the top of wall and fence. From a liability standpoint, developers can deliver a safer product to their customers. 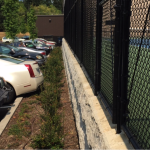 With the high cost of land to build on, Lock + Load Retaining Wall System allows you to get every SF to use. When using the other wall systems, fence posts must be placed at the end or tail of the block in order to achieve the proper depth of the post. With Lock + Load, the fence post can be placed directly behind the panel and achieve the required post depth needed for proper installation. This fence post placement can add an additional 100 to 150 SF of usable land to a building lot or backyard. Lock + Load eliminates the walkable ledge created when using the other wall systems. Because the post is placed up to 12” behind a segmental block wall, this will create an area for someone to walk on top of the wall behind the fence. Lock + Load creates a smaller area that eliminates the ability to walk on top of the wall. Eliminating the walkable ledge reduces liabilities business owners, developers, and school districts face when building walls on their properties. Tired of the old split face block look, looking for something new and different, look no further than Lock + Load Retaining Wall Systems. Lock + Load offers a “Hand Crafted” stone look manufactured in a wet cast production system. Using the wet cast production system, panels maintain a consistent appearance that enhances Lock + Load’s overall appearance. Another advantage to the wet cast production system is the ability to easily add color and create some dynamic patterns in walls. Pacific LOCK+LOAD is a licensee and manufacturer of LOCK+LOAD Retaining Wall products covering the Western U.S. and Northern Mexico.